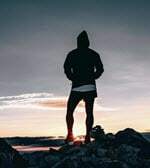 Opera (formerly Opera Software ASA) of Norway announced the inclusion of a free, integrated virtual private network (VPN) in its web browser application. 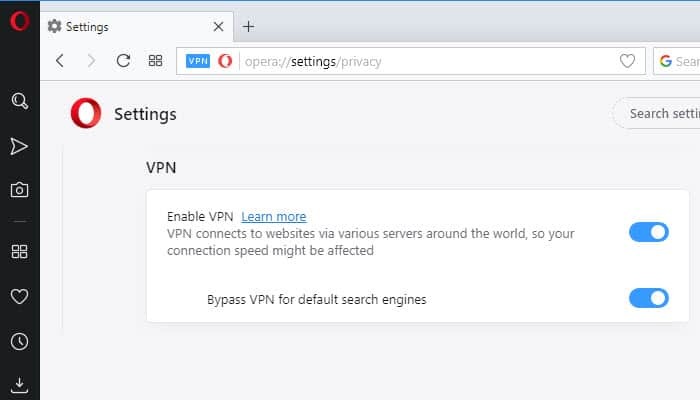 The free Opera VPN feature had originally been available only in the Opera developer version for computers. Now it is available to all users in the current stable channel release. SurfEasy, a company owned by Opera, and located in Canada, provides the VPN service. Free Opera VPN is available without requiring a separate download or extension. 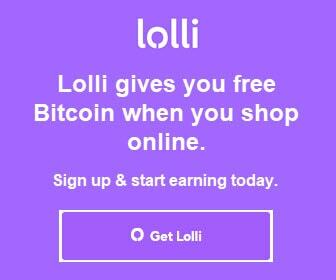 No sign-up process or subscription is required to use the native VPN feature on an unlimited basis. This makes free Opera VPN available to any Opera browser user. 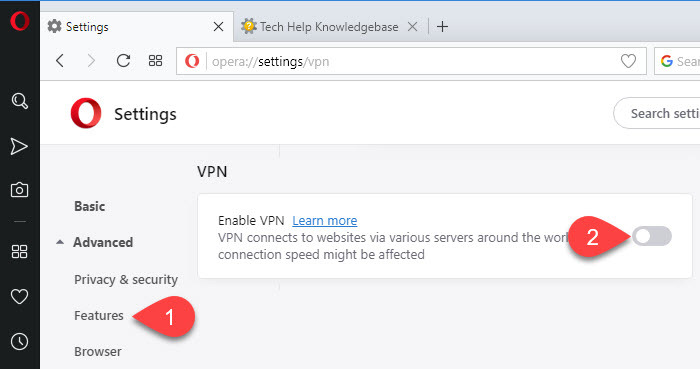 With VPN enabled, Opera users can hide their real IP address. A VPN will replace your actual IP address with a virtual one, making it more difficult to track your computer and location. Content restricted by a school or business firewall becomes accessible when a user enables VPN. When connected to the Internet via public Wi-Fi, a VPN can improve your security. In the Settings page, expand Advanced and click Features in the left navigation (or visit opera://settings/vpn). Scroll down to the VPN section, and toggle the Enable VPN button to the On position. With VPN enabled and turned on, a blue VPN notification icon displays in the address bar. 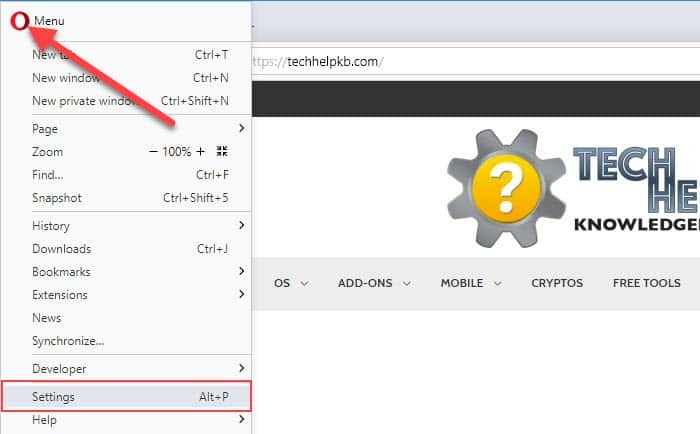 Click the VPN notification icon to display information about your VPN usage and settings. Settings include the option to turn VPN on and off, and to choose a virtual location. Virtual locations include Optimal location, Europe, Americas, and Asia. VPN data transfer information and your virtual IP address also display. When VPN is toggled off from the address bar’s notification icon, the VPN notification will change from blue to gray. It is important to note that the VPN feature is still enabled — it is just turned off. If needed, disable the VPN by returning to Settings > Advanced > Features to uncheck the Enable VPN check box. When the VPN feature is disabled, neither the blue nor the gray VPN notification icon will display in the address bar. 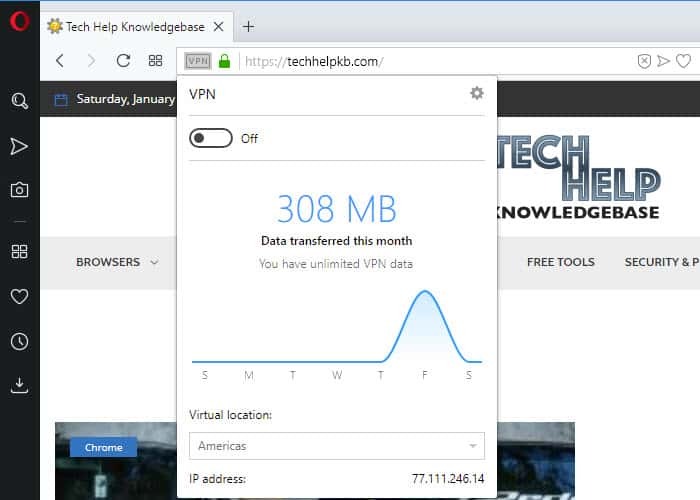 Thank you for visiting Tech Help Knowledgebase to learn how to use the free Opera VPN.